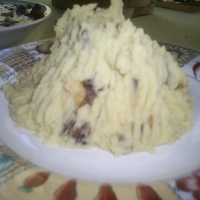 The shaping of the potatoes looks like the mountain from the movie Close Encounters of the third kind. This is a vegan dish that rocks my world. Remove the garlic and let cool, return the potatoes to the oven and bake for another 20m minutes. Add the mushrooms and cook for another five minutes. In a small container, add the water and the cornstarch, mix until cornstarch is dissolved. Add the cornstarch and water mixture slowly to the pan and stir until all of the caramelized bits are dissolved, adjust the amount of water if necessary. Add the Bragg Amino Acid and set aside. A neat trick; Pass the whole roasted garlic head through the ricer, remove the skins. In a bowl from your stand mixer, pass the potatoes through a ricer they will clean out the rest of the garlic in the ricer, remove the skins and rough chop. Place the skins back onto the baking sheet with a teaspoon of olive oil and a little sea salt and place under the broiler to crisp up like bacon bits. Now add the soy milk the Chipotle pepper, some fresh ground black pepper, and the remaining teaspoon of olive oil to the bowl. Place the bowl into your Stand mixer with the mixing paddle attached, whip for 1 minute on high. Pour some gravy on top and let it drizzle down one side to give a volcano effect. 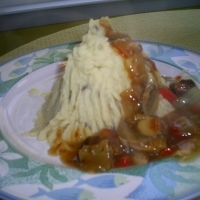 With the Devil's Tower and my Volcano potatoes we could start a new country where only cooks were allowed! These sound AWESOME. Thanks for the post. And thanks for dropping by my page and giving me a nice rating...I appreciate it! You are so very clever! I love the movie and this is such a delicious culinary homage to the film. I'll climb that mountain anytime - and will love every delicious second of it. I think I hear the tones of the mothership...or is that my tummy growling? Great post - thank you!! Fantastic! I agree with chef, it deserves a rating on appearance. I am not vegan but I would love to serve this recipe. Awesome! Loved the movie, really love these! Always looking for good vegan recipes for my daughter-in-law who also has celiac diseae but this is one that I will really enjoy myself. Thanks! PS Where would I get the amino acid-health food store? I'd go vegan just to eat like this everynight! 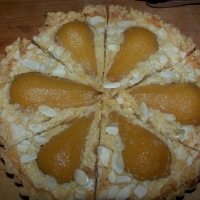 Thanks for the new and creative recipe! OMG, these look fantastic. Can't wait to try. Rating this one a 5 on appearance alone, I'm guessing it deserves a 10 on the taste scale. Great post. Thanks for sharing with us tater lovers. I agree with rml...love it...aliens are always a bonus..teehee!